Welcome to Week 5 of So You Think You Can Decorate! And this week's challenge is fabric! First up, the roman shades and drapes. I actually made the shades using a vinyl mini-blind, Fabritac glue, and denim. 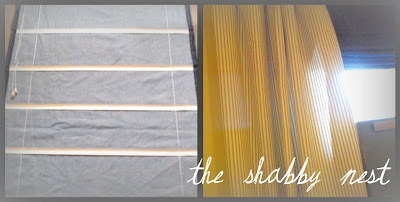 A super easy and inexpensive way to create custom roman shades in whatever fabric you choose. And when I say easy, I mean this is seriously easy folks!! And since I used a tutorial to make these....I'm going to share it with you! Here's the link. The drapes were created using blue and white ticking fabric. They were very simple to sew. I chose not to create a rod pocket, so all I did was hem the top and bottom, leaving the selvages instead of hemming the sides. Then I pinched the tops and attached curtain rings to hang them. 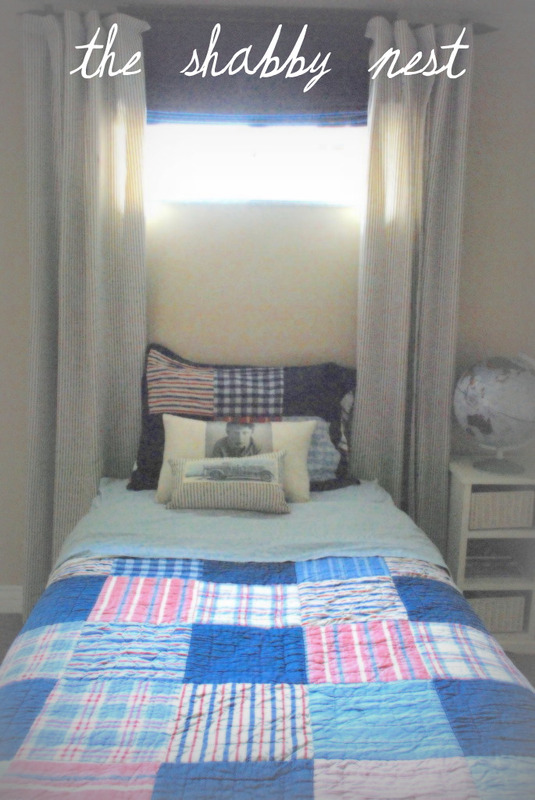 In this photo, you can see the way the ticking drapes frame out the bed. The addition of handmade accent pillows adds softness and personality to the bed. 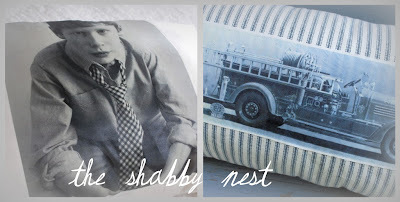 I made these pillows using one of my favorite tricks...photo transfer paper. I just love my son's handsome face looking back from his bed...even when he's not sleeping in it. The firetruck pillow features a vintage firetruck photo and more blue ticking to tie in with the drapes. A couple of tips on using photo transfer paper...first, I recommend the Avery brand. I am not being paid by them, I have just tried pretty much EVERY brand of photo transfer paper out there, and I have had better and more consistent results with Avery than with any other brand. Second, if you are using text in your design, MAKE SURE YOU REVERSE IT. You will need a photo editing program to reverse the text...but make sure you do it. Unless you are extremely particular about an image, they can usually be printed without reversing them. I didn't reverse either of the images used in this project, and I can't see a difference. Then all you need to do is follow the directions on the package. Photo transfer paper is very easy to use, and can create some great custom pieces for your home. For the pillow with my son's photo on it, I simply ironed the photo transfer directly onto the fabric I was using for the pillow. For the firetruck pillow, I ironed it on a seperate piece of canvas, cut it out, and then sewed it as a patch onto the ticking fabric. (Which leads me to another tip on using transfer paper...you don't want to use the transfer paper on fabric with a print...the print will show through). After seeing how cute the portrait pillow turned out, I think I may have to make one of each of my other three kiddos....wouldn't they make a great addition to a family room? Like I said, it's amazing what fabric can do for a room!! I love the pillow with photos and the firetruck. And what a great idea to put them in the family room. Gives me some ideas! thanks! Sweet sweet room, Wendy! The pillows are truly the eyebrow raiser in this one. So unique and personalized! I really like how you position the beds in front of the windows. A very unique headboard indeed! You have a flair with fabric, love the pillows. What a difference some fabric makes, huh?! Looks good!! And,...I love the pillow with #1 on it. Soooo cute,...and clever. Looks much better! I have the same bedding in my boy's room. 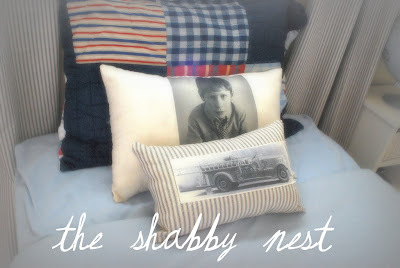 I love the photo transfer idea on the pillows! Looks like an awesome boys room! 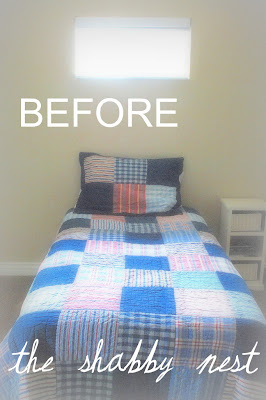 I have to agree with you - fabric is wonderful for transforming a space! Great job on the room and pillows. I would love to add pillows to my son's be but I am afraid he doesn't share the same decorating sense as me and they would be on the floor half the time! You are truly inspiring. I too live in a rental and sometimes feel a bit "left out" because I can't redo the house completely to my liking. I guess that's what fuels the creativity, trying to make a home for the family using budget and rental constraints! You do it beautifully! Thanks for all these wonderful ideas! I can't wait to try them in my son's room. The tutorial is wonderful, and I adore all your pillows! Wow the pillows turned out great - I love them! The ticking material is my fav. My son has the same bedding. How fun to see it dressed differently. Thanks! Everything about this post is SO SO SO sweet!!! I just read the directions for the roman shade - what a great idea, I haven't seen them before. My current client has mini blinds, this will be a consideration - thanks!